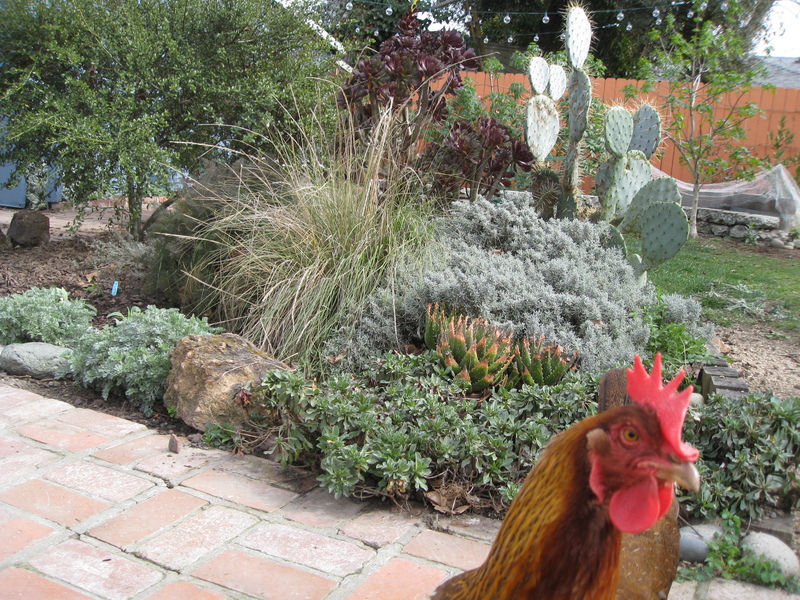 California natives and other drought-tolerant non-natives are blended into our mostly edible backyard garden. Fertilization and pest control is covered by our 2-legged, bug-foraging hens, 4-legged, squirrel-chasing dogs. Pollination services are provided by our hard working, 6-legged bees. Our flock is a mix of Silver-laced Wyandotte, Rhode Island Red, and Buckeyes. The Buckeyes are our newest addition from Sustainable Poultry Network-certified breeder Tom Dinwoodie. In anticipation of planting our garlic, onion, and shallot crop this Fall, you’ll see our girls hard at work in our waning Summer vegetable garden. They’ll turn the soil, add fertility (aka poop), eat up the remaining plant material and generally prepare the beds for Fall planting time. The 2-4-6 Farm Stand in the front yard will feature Meyer lemonade, herb bunches and edible flowers. We’ll provide advice on integrating new chicks into a mature flock, inter-crop grazing, and how to organize Chicken Chat forums to get your neighbors (and spouses) on board with the idea of keeping chickens. All Farm Stand proceeds will be donated to 501(c)3 organization Garden to Table.